Contrary to popular opinion, daily trading is not the only way to earn money in digital asset industry. Mining, staking, airdrop campaigns… there are now dozens of other smart ways to generate income in the world of the blockchain. What’s most tempting is that you can get that income even while you’re sleeping. In this article, Crypterium will help you figure out which option is better suited to your investment capabilities. So get out your piggy banks as we’re going to drop some coins in there. Mining used to be all the rage in the early days of the digital gold rush, but it has since become more professional and difficult. Oftentimes, miners will combine their hash power to increase the likelihood of successfully mining a block together and having more frequent payouts. Yes, you guessed it right — we are talking about conglomerates known as mining pools. To give grounds for analysis, let’s take a look at the stats. 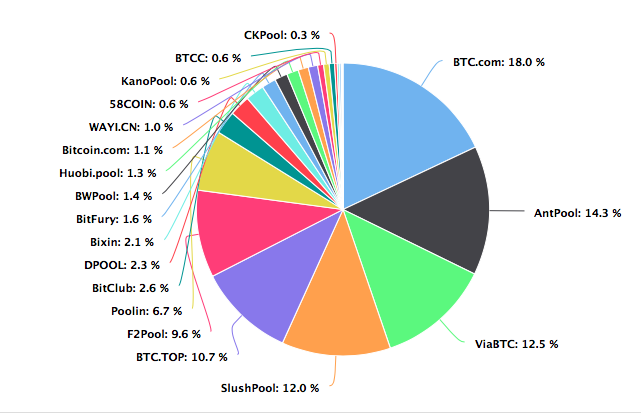 It shows that 55% of the total Bitcoin hash rate belong to four mining pools, the situation with ETH is quite the same. What this means is that the process is completely centralized: those pools have already become large corporations that own so much computing power that a solo-miner simply has no chances to compete with them. Still not ready to give up on mining? Then, why don’t you choose a pool to dive in? Mining is also based on a luck factor — if you mine alone and your hash power isn’t high enough, you may never see a reward come your way. With pool mining, this variance is eliminated and you receive payments that correspond to the portion of the work that you have done. How do I join a mining pool? There are two types of mining pools: free and private. If the mining pool is free the join process is very simple. - download a special software used for mining (there are a lot of programs for each type of minable currency, the most popular for Bitcoin are CGminer and BFGminer). Arguably, you shouldn’t choose new pools for mining, as they don’t have the capacity to earn decent money fast. - Adequate feedback: A quick search of a mining pool’s name will usually reveal any negative aspects relating to a mining pool and its miners. - Fee: The fee percentage is what the owner of the pool will take from your own overall earnings. This can range from 0 to 10%. - Location: If you’re located in Europe and mining on a Chinese server, you may not get the best results. Check if your pool has a server in your country/continent and if so, check the URL for those servers. This will allow you to mine more efficiently. Joining a mining pool doesn’t take away from the fact that you still need to invest in special equipment. Mining pool earnings are still calculated on how much your own computer can mine so you will still need to spend money on building a mining rig if you hope to make anything worthwhile. What you’ll have to calculate first is the cost of a graphics processing unit(GPU), the engine when it comes to mining. In 2017, a growing community of hobbyist miners was snapping every graphics card it could get, creating shortages in online stores. Back then, the costs rose by 60%. But after the market downfall, the prices of graphics cards have returned to their previous level, leaving a lot of miners with losseson their initial investments. The party was also spoiled by the increase of ASIC miners, which entered the market with more powerful chips than their GPU cousins. During the crypto craze of 2017, the demand for ASICs (Application-specific integrated circuit) was so high that the wait time from its order to delivery was sometimes longer than 9 months. Trying to move away from the energy-intensive Proof of work mining protocol, blockchain players have been in search of alternative “Proof Ofs”. Just like that, Vitalik Buterin and his development team have been actively working towards switching to the new proof of stake (PoS) model. As opposed to mining, the approach has nothing to do with noisy machines, graphics cards and etc. Staking is the action of putting up a balance of tokens as a security deposit for the right to validate transactions. When it needs to create a new block, wallets with “staked” coins are chosen at random. The more coins the wallet holds, the more chances it has to get chosen and earn its holder more coins as a reward. This lottery-like model can be seen as a downside, as winning a ‘lucky ticket” depends on the number of coins you have invested in the first place. But the upside is that you can stop staking and sell your holdings at any time. Final requirements for “players” vary from project to project. Usually, there is no specific type of wallet or a minimum amount of coins are needed to start staking. If we take NEO as an example, we see that the entry barrier is very low: you download the official City-of-Zion NEON wallet, transfer purchased NEO from an exchange to said wallet. That’s it! You can now stake your rewards! However, if there are a few coins are at stake, you’ll never win big. Often times, for additionally securing the network a part of block reward is also shared to masternode holders. Unlike “stakers ”, masternodes are not granted for just securing the blockchain, but for enabling extra services such as hosting and maintaining the blocks and enabling the following features: instant transactions, private transactions and etc. Thus, the model involves a little more commitment and set up. Instead of just having a wallet, you need to have a computer that you can dedicate as a kind of server for the purpose, which needs to be connected to the internet 24/7. Also, masternodes require a fixed amount as collateral. Dash, the first coin in the market to introduce the model, set up a minimum entry level for masternodes at 1000 DASH units. And at the time of writing one unit of Dash is approx $200 in price. The reward is generous too — the official Dash website claims that “typically, around 2 Dash is paid to each masternode every 7 days. Generally speaking, you can expect 4–6% ROI annually when stacking coins. 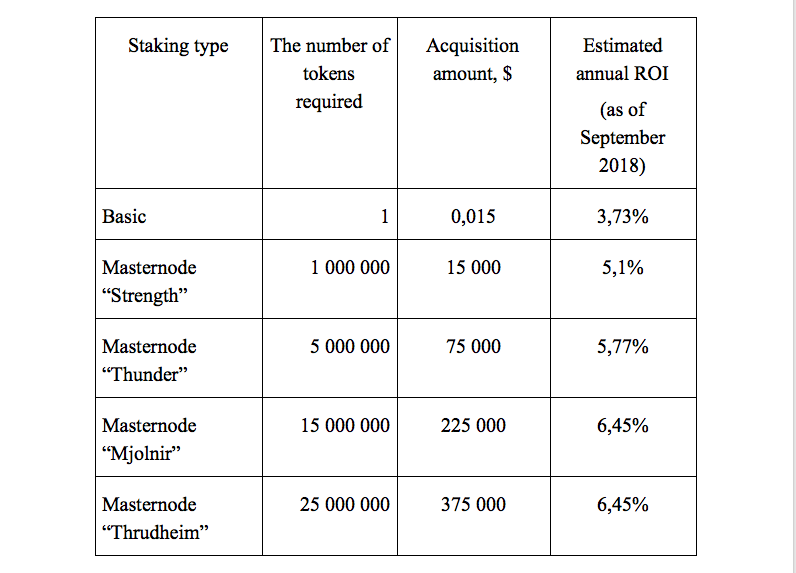 In masternodes, you’ll likely to get more. Let’s take Vechain Thor as an example — a project that has both a masternode and staking feature. Here, the income varies from the type of work masternodes perform. In January 2018, the capitalization of VeChain approached its peak of $ 3,500,000,000. The current cap is set at about 800 million dollars (Sep 2018). Accordingly, if you invest 5,000 USD in VET tokens, you get 4% a year. In case VeChain reaches its former capitalization of $ 3.5 billion, you will not only make money out of the growth rate, but your ROI will also grow significantly — at least 4times– and 5,000 USD invested will turn into more the 20,000 USD. You’ve probably come across the term many times. Airdrops happen when someone gives away tokens or ‘drops’ those tokens into your wallet. It’s as if the coins appear out of thin air, hence the name. Since the aim of such campaigns is mostly to bootstrap the project, the airdrop process usually involves the completion of a number of tasks by the user in order to qualify for the airdrop. When the date of the airdrop arrives, the enterprise will release the free tokens to the users. Companies run airdrops to stimulate project’s community, or attract new users. EOS, for instance, gives its token holders free tokens of any projects based on the platform’s blockchain. Another example is the airdrop of Aelf, that runs Airdrop campaigns accompanied by social media activities. To receive tokens, users have to register on the project’s website and then perform tasks like leaving comments on Facebook, retweeting posts etc. Each task implies a fixed amount of tokens. Crypterium has also run an airdrop in the end of September distributing tokens to celebrate its listing on KuCoin. The first step to catch an airdrop is to sign up for online services that provide timely information about cryptocurrency airdrops — websites, Twitter accounts, Telegram groups, as well as online cryptocurrency airdrop forums. Some examples of such online services include Airdropaddict and bitcoinunicorn.io. The ways listed above are considered traditional among crypto community members. There are a lot of people who have already tried them. Their examples show — it’s not just about earning some extra money but also creating a source of a steady passive income. However, as in any business, you have to make investments of time and finances for being on the wave of success in the future. Disclaimer: information presented here is for educational purposes only and is not intended to be investment advice.